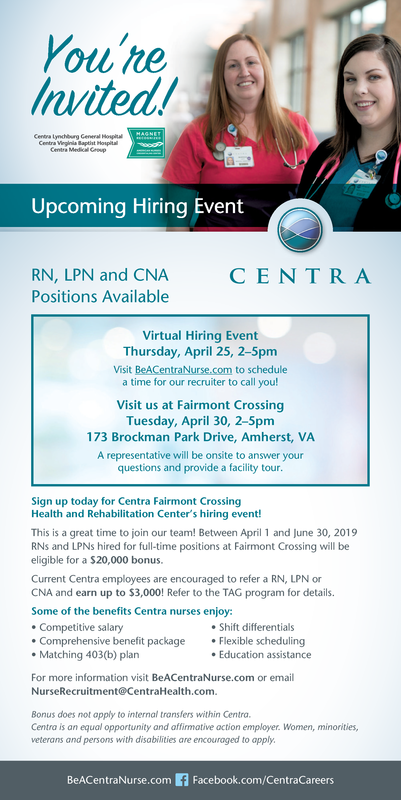 Sign up today for Centra Fairmont Crossing Health and Rehabilitation Center's hiring event! For more information visit BeACentraNurse.com or email NurseRecruitment@CentraHealth.com. Bonus does not apply to internal transfers within Centra. Centra is an equal opportunity and affirmative action employer. Women, minorities, veterans and persons with disabilities are encouraged to apply.